range. 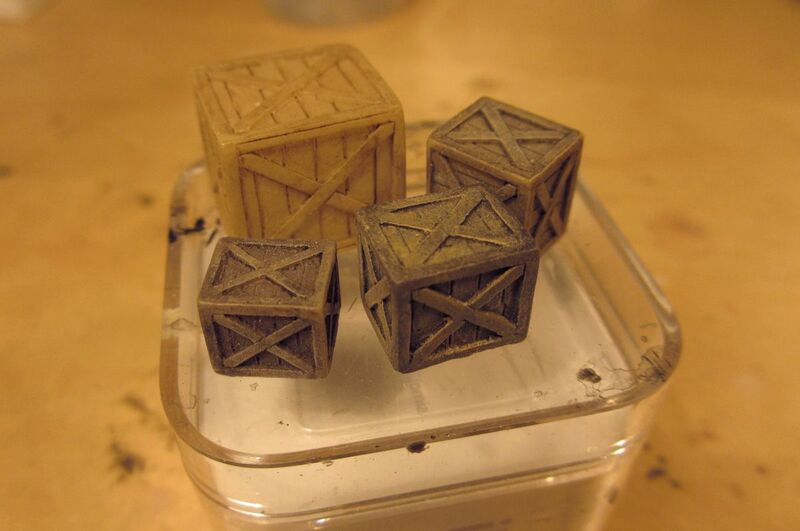 To begin with, here's a variety of crates. 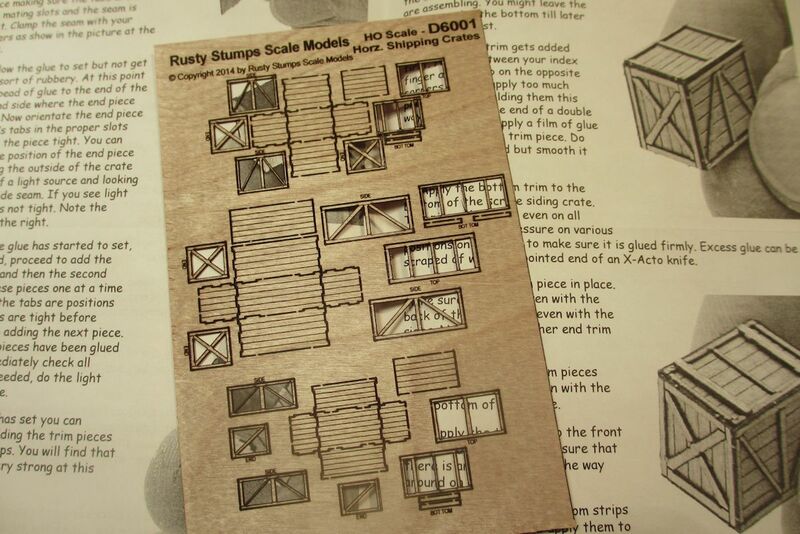 First up are these rather nice crate kits from US-based Rusty Stumps (above). 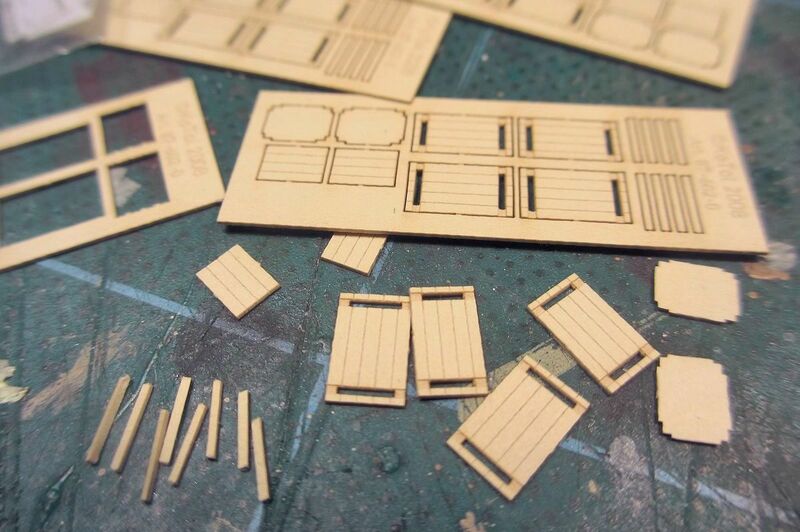 The kits are laser cut plywood and come in various types – these are for horizontal crates. They are HO but quite large. The instructions are very good and the kits are easy to build (I used wood glue). 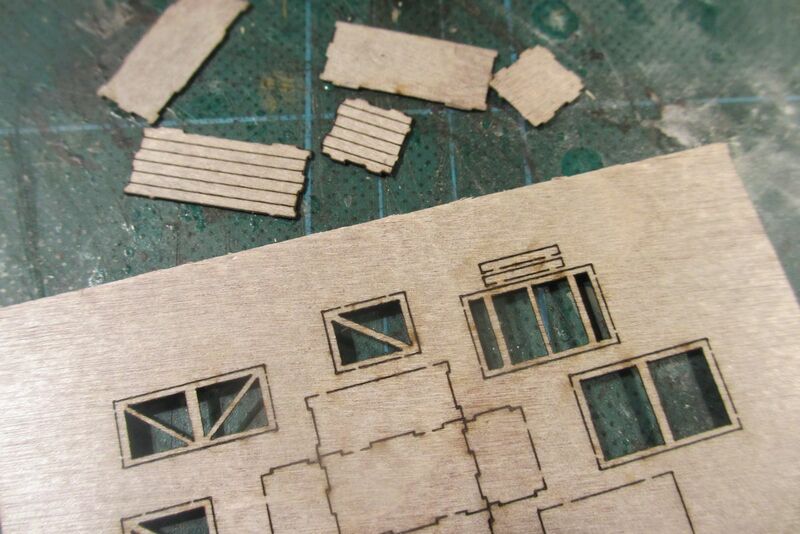 If you prefer a plywood side rather than planks, the kit can be modelled inside out. Parts fit together well and with care the lid can be made as a press-fit, meaning you can take it off if you wish to leave it open. 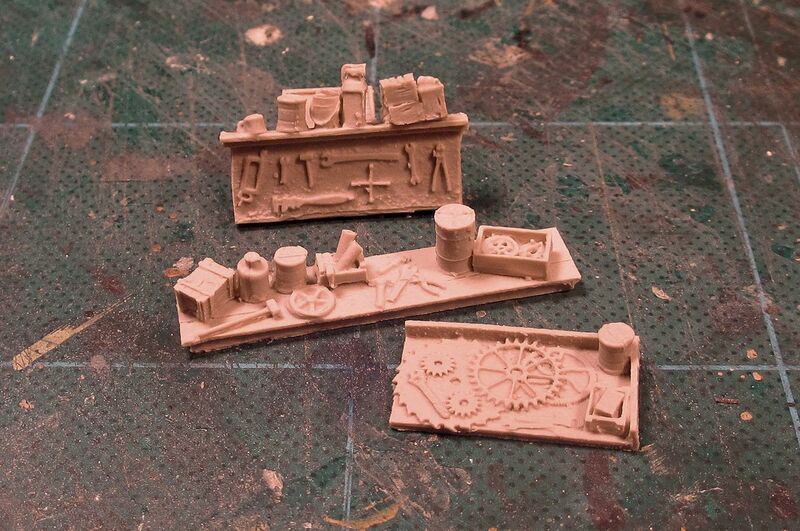 Above are the built up kits next to another offering from Rusty Stumps: Ready-made resin versions of the same crates. The latter clean up reasonably well, but I think you’ll agree that the kits are worth the extra effort. 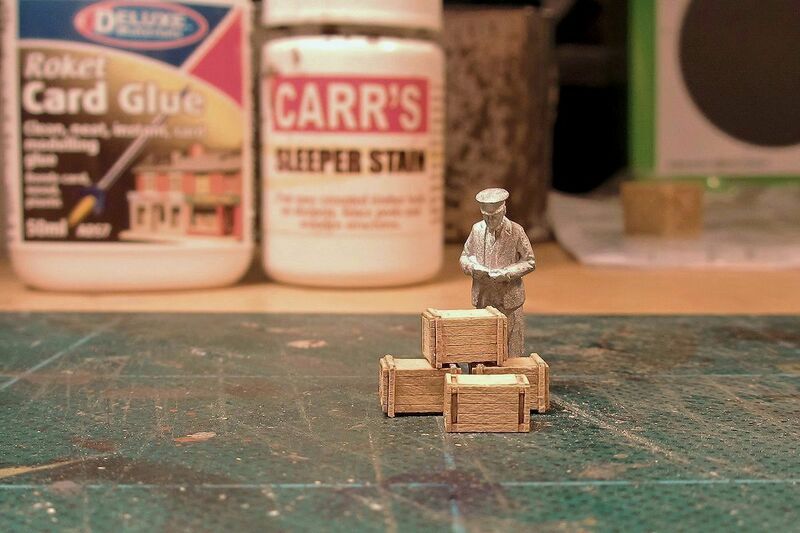 As an aside, Rusty Stumps also do a range of resin workshops scenes. I have no particular use for these right now but couldn't resist having a closer look. Back to the crates. This laser-cut high quality card kit is from the German company Kotol, which Job brought to my attention some time ago (thanks again Job!). The products from this company are not cheap, and some of their items are distinctly continental. But it’s attractive stuff for those who like small details, especially as they use wood, cotton and card for their goods items – so you get lots of texture. The Kotol range is quite varied and has some unusual items (anyone fancy working bicycle lights in H0?). 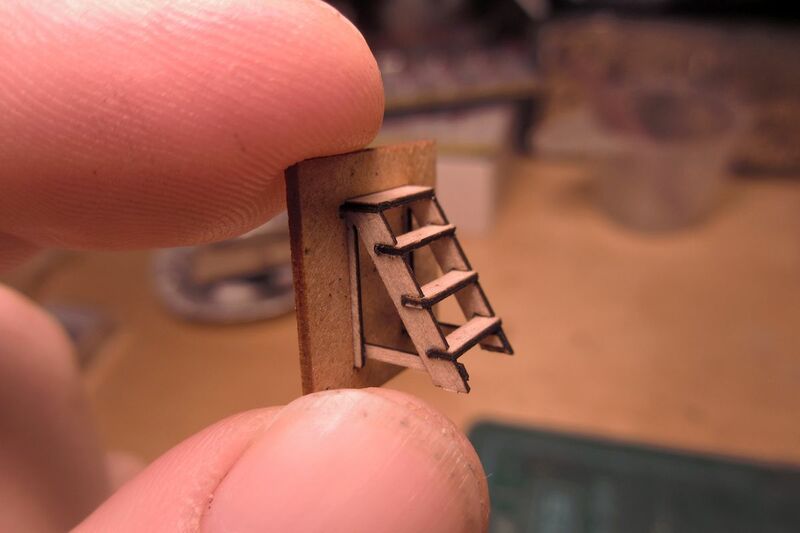 This wood kit for a set of makeshift steps was a quick and pleasant build, and comes with a convenient jig. Scratchbuilding is another option of course. 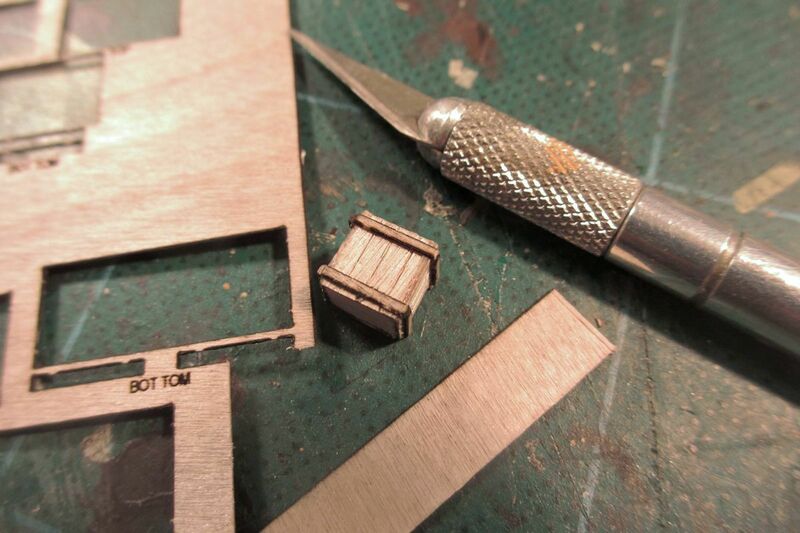 Having built the above kits, I used some of the scrap ply and card to fashion a few extra crates such as the one above. 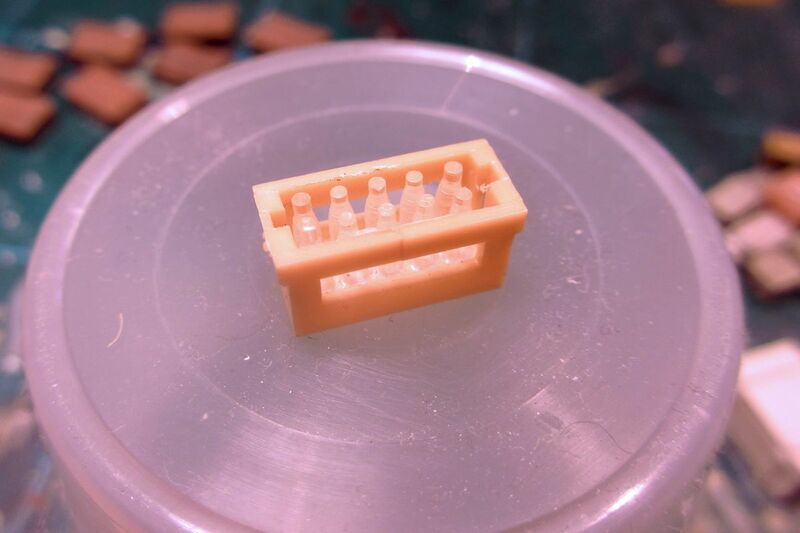 This added to the output from these otherwise somewhat costly kits. The scribing etc does take time, but other than that I would certainly consider scratchbuilding as an alternative in the future. 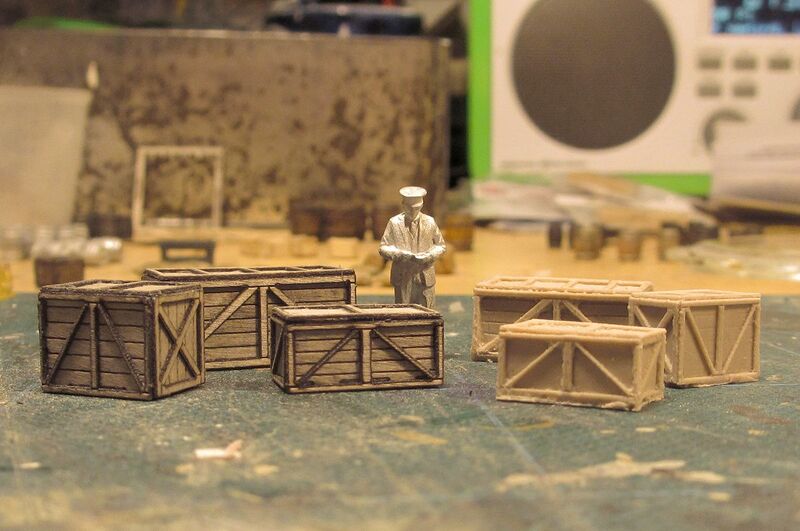 Good old Hornby do these nice ready-made crates (there are others in the package, this is a selection). Some of them are very large and would probably have been dealt with outside the goods depot, not inside. But I find the medium and small ones useful. The one at the rear is as they come, the others have been heavily dry-brushed to add texture and do away with the slightly translucent look. 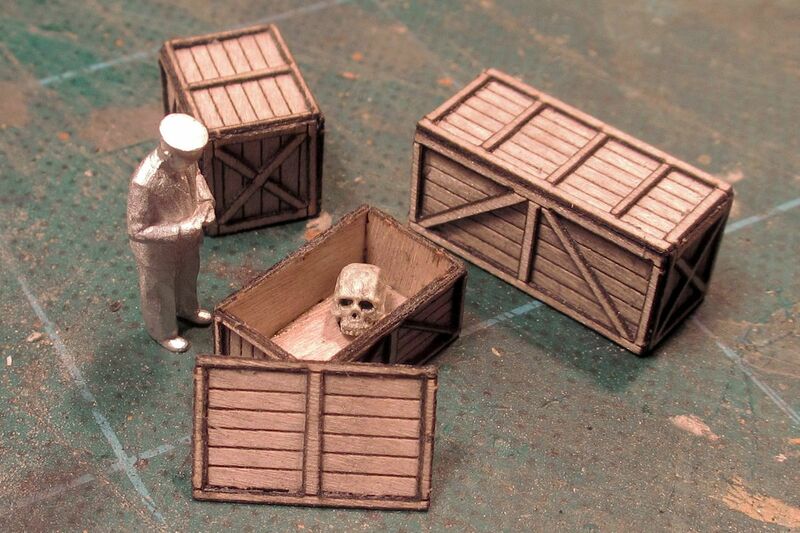 I found this and a couple of other bottle crates in my spares box, and thought it loooked a bit dull. So I decided to have some fun. 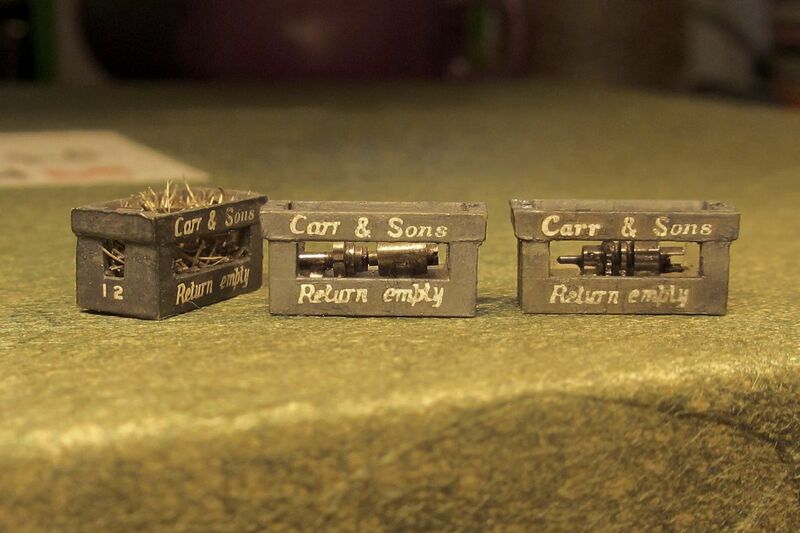 The result was these three machinery crates from Carr & Sons, a well-known Farthing company. A tad fanciful, but I had a fun evening making them. The sharp-eyed may have noticed that “Carr & Sons" looks suspiciously like “To Carry 10 Tons” on a transfer sheet. As many will know, Carr & Sons were leading manufacturers of round tuits. The one at the bottom is the basic model. 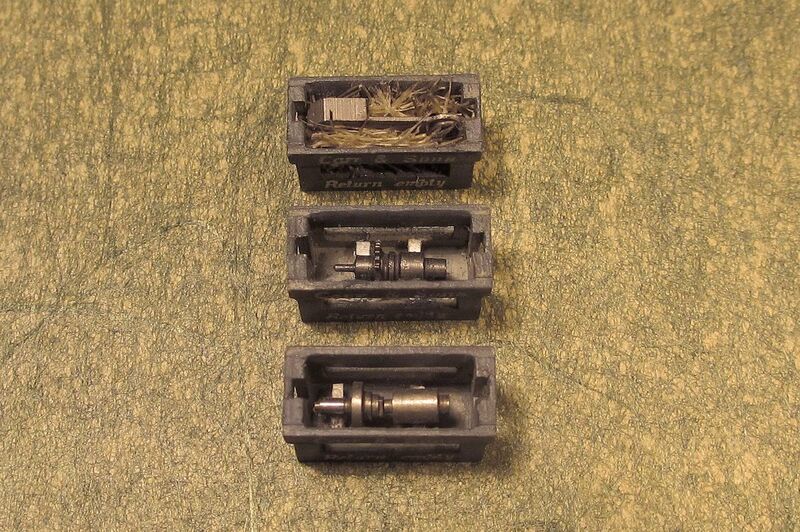 The middle one is the advanced version. At the top is another of the company’s products, the square bloke (a development of the regular bloke).